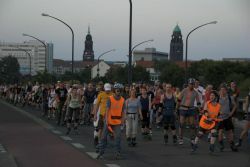 Rules for Participation – Nachtskaten Dresden – Das Dresdner Nachtskaten, veranstaltet vom Förderverein Dresden skatet e.V. Driving is always on the road. 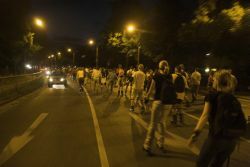 On the sidewalk, the skaters have nothing to look! 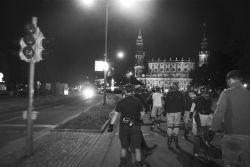 The police are authorized to stop the Dresden Nachtskaten, stop, or change the route if required by traffic safety or other circumstances. The Promoter accepts no responsibility for any damage to persons or property objects. Participation is at your own risk. By entering, each entrant confirms to understand and comply with this rule. Even if you think you ride safely. The next skater next to you may not do that! 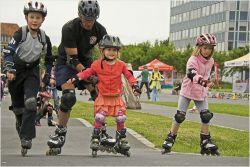 Therefore, we strongly recommend you protective gear to prevent injuries. 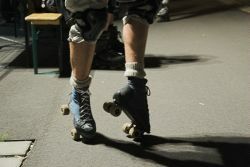 Knee, elbow and wrist guards and a helmet greatly decrease the risk of injury in a fall. 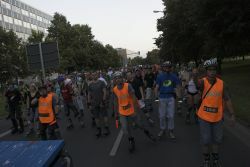 Despite securing the visibility distance is very important, so it would be beneficial readily visible to wear reflective clothing. We also recommend a flashlight for unlit sections of the track. Please ride not only go into the shared folders of the police and road sides and please oncoming traffic. On multi-lane roads is always the right lane to use. 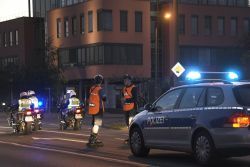 At intersections, Sammmelpunkten and break places you should be careful not to obstruct the traffic behind. To bandwagon you should please keep at least 5m distance and attachments or refrain from putting on the trailer. 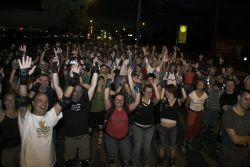 such as railways, road damage, fallen skater etc should be indicated by a show of hands. 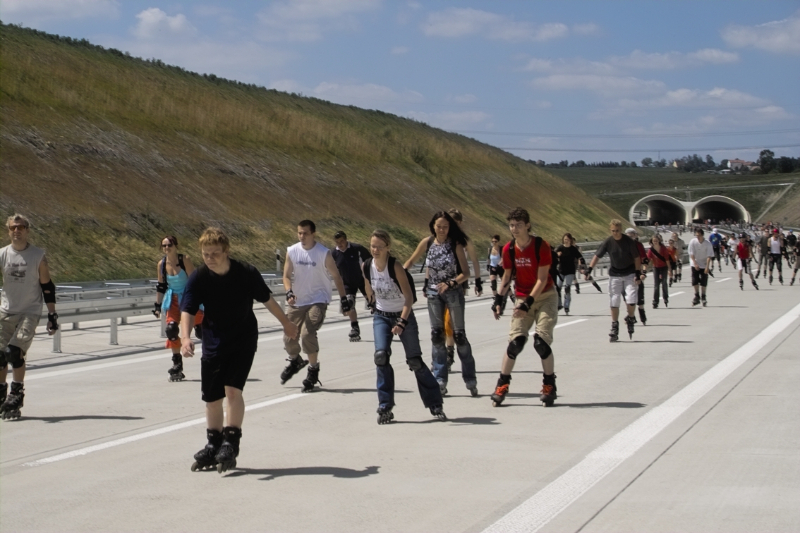 Skaters should raise both hands in the air, it means a hazardous location or a stop. ! There is special attention required! 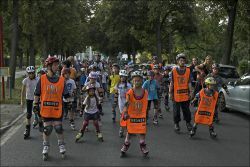 Who want to be on the move more slowly as unsafe driver or skaters should keep to the right in order to speed skaters are not hindered and to prevent accidents. 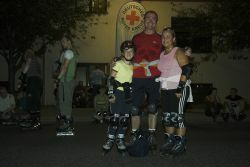 Inexperienced skaters can turn to the folder at any time, they help you down the mountain. Zigzag and backwards, slalom, etc. 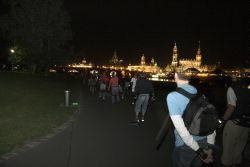 are forbidden at the Dresden Nachtskaten because it can quickly lead to serious accidents and falls due to sudden evasive maneuvers. 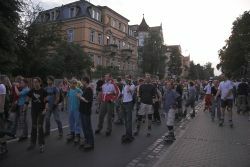 Organizer of the Friends of Dresden Dresden Nachtskatens skate eV represented by the Executive Board. 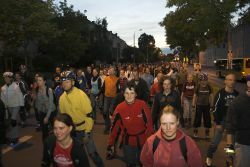 The organizer is obliged and entitled to exclude event participants with unique gross or repeated other breaches of the provisions of the Road Traffic Act, the rules for participation of the Dresden Nachtskatens and orders of the police or of the terms and conditions of the event permit immediately from further participation in the event. Exercise this right on behalf and on behalf of the organizer of the folder.